The Ancona is a light breed of Mediterranean origin and has been named after the province of Ancona in Italy. 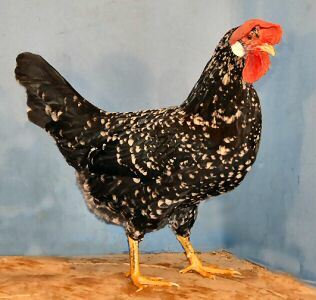 They are recognized as a separate breed but they are very similar to the mottled Leghorn. They are active and excellent foragers, mature quickly and lay well for many years. Their eggs are pure white and large in size. Their plumage is black with a rich beetle green sheen and each feather is tipped with a V-shaped white tip. 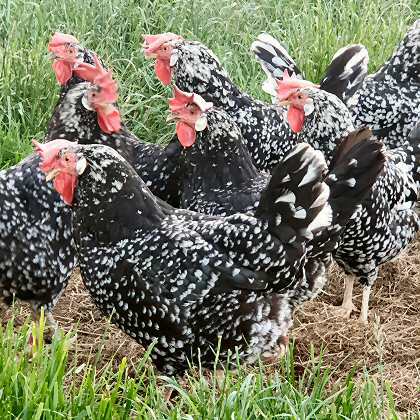 The amount of white in their plumage increases with age which means that pullets with not enough white are likely to have more white in their later years. 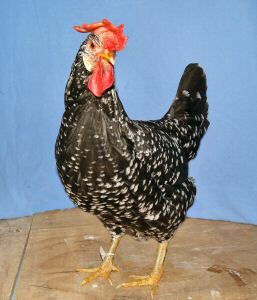 Like most light breeds, Anconas hardly ever go broody. They are very economical to keep and deserve to be more popular than they currently are. Thanks to Marina Steinke for supplying the above information.